Cryptocurrencies are often associated with strong price fluctuations that some argue make them unusable as day-to-day spending currencies. However, the reality is that the world’s leading digital currency bitcoin has helped to act as a store of value and as an alternative currency in countries that are suffering from high levels of inflation and weakening sovereign currencies. Hyperinflation occurs when a country is experiencing a severe downturn in its economy but continues to increase its money supply by printing money. This results in an imbalance between GDP growth and inflation, which leads to a drop in the value of the country’s sovereign currency and further deepens economic woes. While hyperinflation has only been witnessed a few times in history, it was only ten years ago that the Southern African nation Zimbabwe fell victim to this man-made financial crisis. In 2008, Zimbabwe witnessed a record inflation rate of over 231,000,000 percent, and was eventually forced to give up its sovereign currency as it had lost over 99 percent of its value against other currencies. The Return of Hyperinflation in Zimbabwe? Since the government of Zimbabwe introduced the Zimbabwean bond notesin 2016 as a solution to combat the country’s cash shortage, fears emerged that the newly introduced bond notes would suffer the same fate as the Zimbabwean dollar did in 2008, and lead the country into another period of hyperinflation. Since the introduction of the bond notes, which are supposed to be pegged one-to-one to the US dollar, Zimbabwe’s new currency lost value almost immediately as Zimbabweans’ fate in the newly issued currency dwindled quickly. So far, the country has managed to fight off hyperinflation due to Zimbabweans’ continued use of international currencies such as the US dollar, the South African rand, and the British pound and the central bank’s efforts to inject foreign currency into the economy. 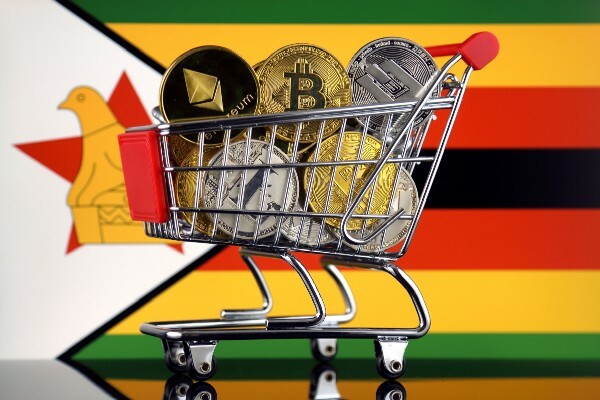 Interestingly, concerns about the future of the Zimbabwean bond notes have led many Zimbabweans to look towards bitcoin as a new payment method to engage in trade and as an alternative store of value. It will come as no surprise that Zimbabwe has one of the liveliest bitcoin communities and highest adoption rates in Africa given its history with hyperinflation and the cash shortage the country has been finding itself in over the past few years. Cryptocurrencies can act as a hedge against declining local currency value as they run on decentralised networks and, thus, cannot be influenced by a government or central bank. Bitcoin, for example, has been outperforming several sovereign currencies that have been suffering from galloping inflation in the past few years. Alternatively, so-called “stablecoins” can also provide a safe haven for citizens in countries that are suffering from high rates of inflation. Stablecoins are digital currencies that are backed by a stable fiat currency — such as the US dollar — but are trading on cryptocurrency exchanges just like bitcoin or litecoin, making them accessible as a store of value for anyone with an Internet connection. Cryptocurrencies can, therefore, act as an alternative to existing government-backed currencies, especially in developing nations that are struggling to maintain the value of their local currencies.